Jerusalem - Gold Oval Challah Cover CAT# CHE-18. Chain - stitched hand - embroidery on raw cotton using various colors of silk, gold and silver threads. 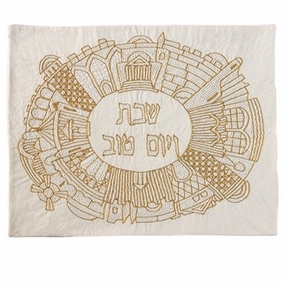 Size: 20" x 16" .At the beginning of a Shabbat or holiday meal, a blessing must first be made over the wine (Kiddush) in order to the sanctify the Shabbat. This is followed by the blessing over the bread (challah), which begins the meal. However, in the hierarchy of blessings mandated by the Sages, the blessing over bread should precede the blessing over wine. In order to preserve the priority of the wine, and not to "shame" the bread which should be blessed first, the bread is “removed” by concealing it from view with the challah cover. In the absence of a challah cover, one may use a napkin, doily, tissues, or similar covering.